(REAL SIMPLE) -- She was a true kindred spirit --until she revealed your secrets to a roomful of people or "forgot" to invite you to her birthday dinner. 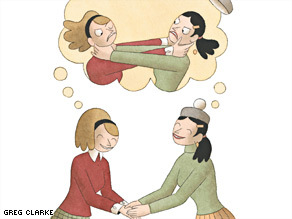 Experts advise on what to do when a friend's behavior turns foul. My friend's wife, Crystal, shares a birthday with my husband, John. She said she was getting a few friends together to go out. I waited for our invitation, but instead she asked if I could babysit. Advice for Caroline: "Crystal didn't want to share her birthday, and she expressed that in a rather malicious way," says Marla Paul, author of "The Friendship Crisis." In this situation, Caroline's best bet is to leave the incident alone and focus on staying connected to Crystal's husband, not to Crystal. "Crystal's actions have made it clear that she isn't interested in socializing with Caroline," says Paul. If this happens to you: Crystal's harsh behavior calls for somewhat harsh tactics. But if a friend snubs you in a way that's not as severe and you want to maintain ties, speak up and swallow any fear of looking needy. Tell her you've noticed that she isn't inviting you to do things with her anymore and that you're not sure why, advises Paul. This allows your friend to explain herself without being bombarded by guilt. Advice for Gina: "Gina might have felt less steamed if she had expressed her disgust right away," says Florence Isaacs, author of "Toxic Friends/True Friends." She could have said something like "I was shocked by the mess left in my apartment. Did you expect me to clean this?" "They're afraid to communicate what's wrong because they don't want to alienate a friend," says Isaacs. In fact, she says, talking it out usually helps save the friendship. Use statements beginning with I ("I was surprised! "), not you ("You're a slob! "), to avoid a defensive response. Advice for Staci: Life Rule No. 1: "Don't handle personal issues by e-mail -- it usually makes things worse," says Harriet Lerner, a psychologist and the author of "The Dance of Anger." "Staci would have gained more insight by calling her friend and extending an invitation, without accusing her of falling out of touch." Whether the friend accepted or not would have revealed her willingness to rekindle the relationship. So what can Staci do now? She can backtrack and try calling once with an invitation, just to see what happens. But if that fails, she might have to accept that not all friendships are meant to last. If this happens to you: Taking a low-pressure approach is best when a friendship drifts apart. "Stay on the periphery and occasionally ask your friend to get together," suggests Lerner. If you pursue her too eagerly, she'll probably feel harassed and may retreat. For years, Mary and I were both friends with a woman I'll call Sue. The three of us ate, traveled, and threw wedding showers together. Six years ago, Sue developed cancer. Advice for Amanda: "While Amanda couldn't change Mary's behavior toward Sue, she could have invited an explanation," says Josselson. She may even have learned something surprising about her friend. (For instance, maybe Mary lost a close relative to a debilitating disease and really couldn't deal.) If Amanda still found Mary's behavior unjustified, she would have to decide if she could continue being Mary's friend, knowing that Mary might act in a similar way in future situations. If this happens to you: If you find one friend's behavior abhorrent and she has no satisfying excuse, the only answer may be to walk away and end the friendship. If you want to be direct, you could say, "I don't approve of the way you treat people (or 'I don't feel comfortable with your values'). We can't be friends anymore," says Isaacs. A less confrontational approach is to tell a white lie. You can say something like "I have time these days only for family and a few close friends. I'm sorry." The person will still feel rejected, but it's less likely you'll have to get into a back-and-forth with her, says Isaacs. When my friend was expecting her second child, my husband, a carpenter, and I, a painter, offered to spend a day renovating her guest room so it could be the baby's room. Our services were to be our gift to her. On the appointed day, we arrived at her home, an hour and a half from ours, at 9 a.m. If this happens to you: This is a good template for dealing with a friend who puts her needs above yours: Calmly explain how her behavior effects you and ask to find a compromise, says Isaacs. If her "I'm more important" attitude doesn't change, it might be time to distance yourself from this person. Advice for Sarah: Betrayal, bad-mouthing, lying -- these issues can destroy a friendship. But copying flower arrangements? "Sarah should have reminded herself that imitation is the sincerest form of flattery," says Laurie Puhn, an attorney-mediator and the author of "Instant Persuasion." If this happens to you: Have you been imitated by a pal one too many times? Say something like "Wow, we have the same taste. Great minds think alike, huh?" Puhn suggests. That way, you are subtly noting the similarity, but out loud, and hopefully she'll get the hint. If you want to take things a step further, try, "I notice you got the same dress as mine. Sometimes I enjoy finding things that are unique, and I would hate to think this would happen a lot," says Puhn. But check yourself before you go that far: If saying something like this doesn't feel right, that's a strong sign you should question your own emotions and motives before confronting your friend. In college, I briefly dated a guy. He ended it abruptly, and I learned why: The girl he used to date was returning from studying abroad, and unbeknownst to me, they had never broken up. Advice for Melissa: She could have invited her friend to lunch and told her how she felt -- angry, disappointed -- without scolding. After hearing Melissa's viewpoint, her friend might have apologized and reearned her trust, says Lerner. If this happens to you: Once again, it doesn't help to stay silent when you're feeling betrayed. "Nor is it fair to your friend," says Lerner. However, if your friend doesn't apologize (or if she does but promptly overdiscloses again), Lerner adds, it should be clear that this is not a friend to confide in. This doesn't mean a friendship has to be over, however. If a person comes through for you in other ways, perhaps you can learn to accept this one shortcoming.